Japanese people's awareness of the outside world and helped bring about rapid growth of Japan's economy. Ensure that every aspect of Games delivery incorporates the relevant principles laid out in the Games Vision, including in the development of venues and infrastructure and the staging of the Opening and Closing Ceremonies. The Tokyo 2020 Games will encompass a wide range of areas, with a far-reaching time and regional span. We will establish a cross-sectional framework from the initial phase to ensure the active engagement of the Government of Japan, the Tokyo Metropolitan Government, the JOC, the JPC, the business community, and other relevant parties. We will also establish an "Action & Legacy Plan" in 2016. 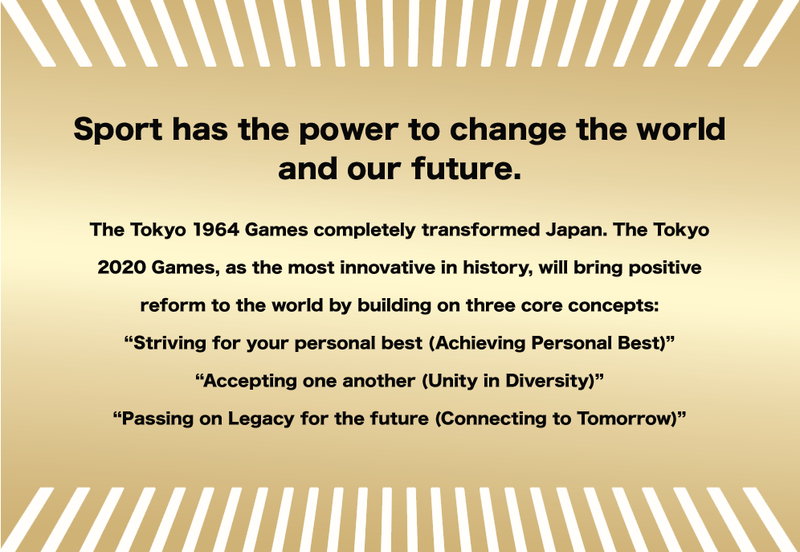 Incorporate the recommendations adopted in the Olympic Agenda 2020 into the delivery of the Games; the Tokyo 2020 Games will contribute to the beginning of the Olympic reforms included in the Agenda 2020.